Fr. b: Shank square in sections, tapers toward tip; irregular pentagonal head raised in middle. p.L. 0.037, W. head 0.015 m.
Fr. c: Shank square in sections, tapers toward tip; domed head embedded in mortar. p.L. 0.042, W. head 0.020 m.
Fr. d: Shank square in sections, tapers toward tip; pentagonal head raised in middle. p.L. 0.048, W. head 0.019 m.
Fr. e: Irregular, flat head. p.W. 0.020 m.
Fr. f: Rectangular, slightly raised head. p.W. 0.023 m.
Fr. g: Rectangular, slightly raised head. p.W. 0.028 m.
Fr. h: Rectangular, flat head. p.W. 0.024 m.
Fr. i: Rectangular head with circular corners, slightly raised head. p.W. 0.025 m.
Fr. j: Rectangular head with circular corners, slightly raised. p.W. 0.029 m.
Fr. k: Spike. Rectangular, flat head. p.W. 0.033 m.
Fr. l: Spike. Rectangular, flat head. p.W. 0.029 m.
Fr. m: Spike. Rectangular, flat head. p.W. 0.032 m.
Fr. n: Large spike. Polygonal, flat head. p.W. 0.055 m.
Fr. o: Large spike. Polygonal, slightly raised head. p.W. 0.038 m.
Fr. p: Shank square in section widening to head. p.L. 0.068 m.
Fr. q: Shank square in section, heavy corrosion and encrustation/adhering dirt all around. p.L. 0.076 m.
Fr. r: Shank polygonal in section, widens toward head and tip (result of weathering?). p.L. 0.073. Fr. s: Shank square in section; severe corrosion and encrustation/dirt adhering. p.L. 0.058 m.
Fr. t: Chunk of mortar containing some ash (scorched? ), with fragments of bronze pin and long, thick iron spike incorporated. p.L. 0.068, p.W. 0.050, p.Th. 0.047 m.
Fr. u: Chunk of mortar containing some ash (scorched? ), with irregular small fragments and flakes of iron. p.L. 0.057m p.W. 0.052, p.Th. 0.038 m.
Fr. v: Flat fragment of iron widening toward one end, splinter from spike shank or segment from blade? p.L. 0.067. Fr. w: Square fragment of thin bronze sheathing (cf. KTH0256). p.L. 0.034, p.W. 0.032, Th. 0.0003-0.0005 m.
31 total fragments. 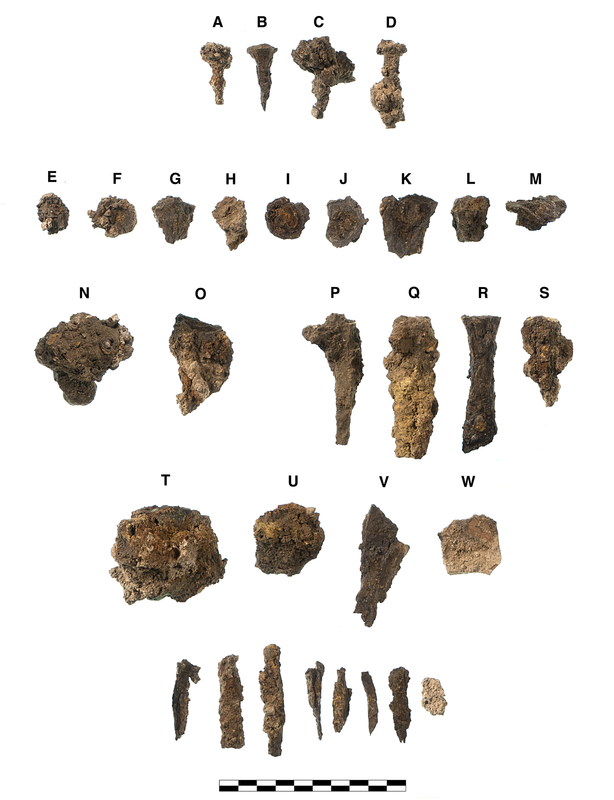 Large fragments (a-d) of four nails and heads all missing tip and three with thick mortar adhering; 11 irregular fragments (e-o) of heads and four fragments (p-s) of shanks from nails and spikes (MNI 10); four large fragments of mortar, iron, and bronze (t-w); and eight other small, irregular fragments and flakes. All with moderate to severe corrosion and flaking.